Looking across from Emigrant Pass towards the Kingston Range in the eastern Mojave. The Old Spanish Trail passed through the valley in the foreground. The stunning Mojave Desert extends for over 25,000 square miles (65,000 sq km) in the southwestern portion of the United States. Crossing into areas of southern California, southwestern Utah, southern Nevada and northwestern Arizona, the extensive desert plays a significant role in shaping the lives of those who call it home. It joins with the Sonoran, Great Basin, and Chihuahuan deserts in forming the North American Desert. The term Mojave derives from Mohave tribe of Native Americans that originally inhabited the area. As a tribal name Mohave survives to this day, and is still used to refer to native inhabitants of the region. However, the modern Mojave Desert extends beyond the traditional tribal boundaries of the Mojave. In modern definitions, the desert reaches from the Great Basin Desert to the North to the Sonoran to the south. In terms of latitude, the desert reaches from approximately the 34° line to the 38° line. However, technical definitions of the desert that rely on strict latitude measurements are not considered practical by many people. 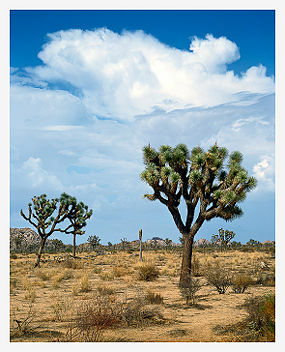 A simpler, although less scientifically accurate, technique for defining the borders of the desert is the presence of Joshua trees. This unique tree, considered the symbol of the Mojave Desert, have great difficulty in growing outside its borders. Mojave Desert scene in Joshua Tree National Park. The Mojave Desert, while bordered by mountain ranges, boasts a relatively small level of altitude change within the desert itself. Most of the area maintains an elevation between 3,000 and 6,000 feet, with notable exceptions at Telescope Peak and Badwater. Both Telescope Peak and Badwater are found within Death Valley National Park, and these geographic features demonstrate the extremes of desert altitude. Telescope Peak towers above its surroundings at an altitude of 11,049 feet, while Badwater dips to an elevation of 282 feet below sea level. 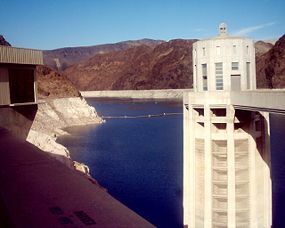 Lake Mead provides much needed water for cities in Arizona, California, and Nevada. The Mojave Desert is constantly faced with a shortage of water, a situation that threatens existing populations and intimidates future development in the region. Few streams cross the interior of the area, however the Mojave River in the south provides an important supply of water to the areas surrounding it. Due to the Mojave River, many parts of the desert can receive the water that is necessary for survival. Another important river to the Mojave Desert is the Amargosa River, which flows from the Great Basin Desert to Beatty, Nevada. The Colorado River is also considered to lie within the borders of the Mojave, but due to its location on the edge of the desert, it does not provide a major source of water to the interior. One of the most unique natural features that is found within the Mojave Desert is the Kelso Sand Dunes, famous both for their beauty and their mysterious formation. These sand dunes, formed primarily out of fine grain residual sand and rose quartz particles, exhibit a distant pink color. Most unusual, however, for a natural geographic feature is that these sand dunes actually create a booming noise. Described by some as a "barking" noise, most scientists believe that the sound is caused by the friction between quartz and feldspar grains of sand. While breathtaking in their modern form, the Kelso Sand Dunes pose a historical enigma. Research has shown that the sand levels are not being replenished through modern wind currents, posing a question about how the sand dunes came to be formed in the first place. To this end, geologists have proven that the dunes were actually formed through a series of layers 25,000 years ago that built up as a result from climatic change. The Mojave Desert is an area of extreme climactic changes, with temperatures often reaching 120°F in the summer months and dipping to below freezing on winter nights. Unlike many other areas in the southwestern portion of the United States, the Mojave Desert exhibits four distinct seasons that control and shape living conditions in the desert. 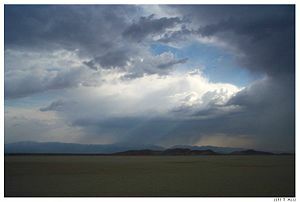 Winters in the Mojave Desert are characterized by freezing night time temperatures and occasional rainfall. In the mountain peaks, temperatures during this time can reach 0°F at night. Other areas, including the far reaching valley floors, are more manageable for wildlife, reaching only 20°F in the evening hours. Precipitation during this season is commonly the result of storms that move down into the area from the Pacific Northwest. These storm systems often bring rain, or even snow, to the desert. Despite the rain, however, temperatures during the day can reach 80°F in the time periods between storm systems. Spring is time of rejuvenation for the Mojave Desert, with many of the areas becoming blanketed by a rich field of wildflowers. Vegetation growth during spring is possible due to increased rainfall, and less extreme temperature variation than is found during the winter season. Rainfall levels slip into decline beginning in April, with rainfall becoming a rarity as the area enters the summer months. Summer Storm in the Mojave. The summer months of the Mojave Desert are characterized by a heavy and oppressive heat that settles on the region. The temperatures, sometimes reaching above 120°F are what is generally considered a "dry heat," a coupling of low humidity, low pressure, and high temperatures. This season also poses the threat of monsoons in the area, which are drawn by the low pressure coming from the Gulf of Mexico. The movement of storm systems from the Gulf of Mexico can result in thunderstorms or sporadic rainstorms. Autumns are generally considered the most pleasurable time to visit the Mojave, an opinion which consequently causes an increase in visitors during the seasons. After the occasional thunderstorms of the summer months, the Mojave settles in a steady weather pattern with less unpredictable showers. Temperatures also experience a slight dip during this season, ranging between 70°F and 90°F on the valley floors. The Mojave includes a wide variety of flora and fauna, many of which species are only found within the borders of the desert. Particularly notable is the wide variety of cacti in the region, with the silver cholla, Mojave prickly pear and beavertail cacti native to the area. As in most Californian deserts, the Mojave is also distinguished by a large population of the distinctive many-headed barrel cacti. Besides the cacti population, the Mojave desert supports diverse and plentiful vegetation, including creosote bush, burroweed, Yucca, and desert holly. However, the most prominent plant species of the area is the Joshua Tree, whose unusual shape has gained its role as a symbol of the desert. While the Joshua Tree is endemic to the Mojave Desert, many of the plant species found in the region are not specific to the Mojave. In particular the vegetation of the Mojave bears a strong resemblance to the plant life found in the Sonoran Desert to the south. While the harsh environment and difficult conditions of the Mojave Desert challenges the survival ability of many animals, a few species have become adapted to the strenuous circumstances. Most notable among the desert wildlife is the California Desert Tortoise, who has adapted to the limited water availability and is able to contain a liter of water within its body. During spring these tortoises ingest as much water as possible in order to be able to make it through the summer months. Unfortunately, the populations of desert tortoises continue to dwindle, earning the species a place on the endangered list. Other important animals to the desert ecosystem include: Cougar, Coyote, Desert Bighorn Sheep, Desert horned and Zebra-tailed lizards, Desert iguana, Gila Monster, Gopher Snake, Hummingbird, Jackrabbit, Mule Deer, Pronghorn, Red-tailed Hawk, Scorpion, Tarantula and Western Diamondback Rattlesnake. The development of large animal populations in the desert is aided by the central salt flats, which provide salt, borax, and potash. These minerals are also gathered for human use, along with iron, silver, tungsten, and gold. A conscientious effort is currently underway to retain the original habitats of the Mojave Desert and protect the area from further encroachment by urban society. To this end, about half of the original habitat of the desert is fully intact, with the other half only minimally damaged by modern society. The rate of preservation ranks the Mojave Desert as one of the best preserved ecosystems in the United States, a fact partially due to a law called the California Desert Protection Act. As Los Angeles and Las Vegas continue to expand however, the area is constantly under threat from environmental contamination. For example, recently Los Angeles suggested the idea of a large landfill in the desert, a move that would destroy many of the natural ecosystems. Off–road driving and private ownership of some areas also threatens to mar the overall environmental integrity of the region. While human activity has the capacity to harm the desert, some damage is being done by natural forces. For example, the Death Valley Region, one of the most important remaining habitats, is currently under threat from extremely low annual precipitation levels. The Mojave Desert has proven to be a difficult terrain for human occupation, its harsh weather causing the occupation levels to be relatively low throughout its history. Originally inhabited by the Mohave Indians, the area was largely neglected by outside populations until the discovery of gold and silver deposits in the area. The discovery of these deposits fueled a veritable gold rush, where cities sprouted over night in an attempt to get rich quick. Mining, however, did not prove as profitable as was expected and many left the newly formed Mojave Desert towns to return to their former homes. The mining cities were abandoned and left to decay in the harsh sun of the Mojave. The most famous of these ghost towns, Calico, can still be toured by visitors seeking to learn more about early mining methods. Some of the other ghost towns are of the more modern variety, created when Route 66 (and the lesser-known US Highway 91) were abandoned in favor of the Interstate highway system. Despite its history as a hub of human occupation, the Mojave Desert continues to be sparsely inhabited. The interior in particular, where the weather is the most extreme, hosts a very small settled population. On the fringes of the desert, however, modern urban life has made living in the Mojave Desert a palpable possibility for hundreds and thousands of people. The city of Las Vegas, a testament to modern technology, allows 1.9 million people to call the Mojave their home. Smaller urban centers in the desert include: Laughlin, New Mexico, Palmdale, California, and Victorville, California. Welcome to Las Vegas, Nevada. While the Mojave continues to attract nature lovers for its distinct and breathtaking beauty, most of the visitors to the desert are not seeking the solitude of nature. 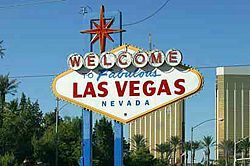 Las Vegas, an extremely popular gambling and entertainment center, has become the main draw for tourists to the Mojave Desert. The city, which hosts over 3.8 million visitors a year, has become known around the world for its attention to entertainment and legalized gambling. For the individuals who are not seeking the glittering lights of Las Vegas, four National Parks offer the opportunity to explore the unspoiled beauty of the Mojave Desert. Visitors to the area can engage with the desert at the Death Valley, Joshua Tree, Zion and Grand Canyon National Parks, all within the desert or adjoining it. Besides the major national parks there are other areas of identified significance and tourist interest in the desert such as the Big Morongo Canyon Preserve, which spans the Mojave and Colorado Desert, and the Red Rock Canyon National Conservation Area, 17 miles west of Las Vegas, both of which are managed by the Bureau of Land Management. For the more extreme sports enthusiast, many of the lakes in the desert offer a variety of water sports. Also, many visitors to the sand dunes take advantage of the unique terrain to practice off road driving. The Mojave Desert has captured the imagination of visual and literary artists alike, often serving as a background for books, films, or television shows. 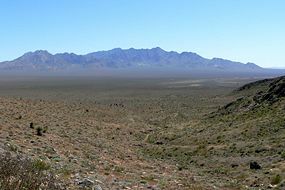 The representations of the Mojave range from serving as a backdrop for the Madonna music video "Frozen" to hometown of Captain Christopher Pike in the Star Trek series. Pioneer cabin remains near St. George, Utah. World Wildlife Fund. Mojave desert (NA1308) Retrieved November 7, 2007.